This travertine cleaning Kings Lynn project came about because our client could not keep her tumbled travertine floor clean. 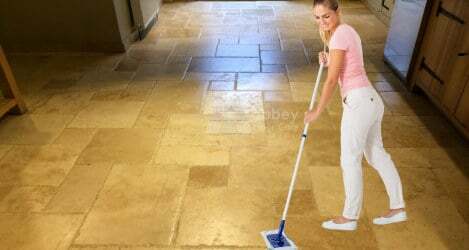 Cleaning a tumbled travertine floor can be really difficult. It is especially hard to remove soil from the natural holes and voids in Tumbled Travertine. 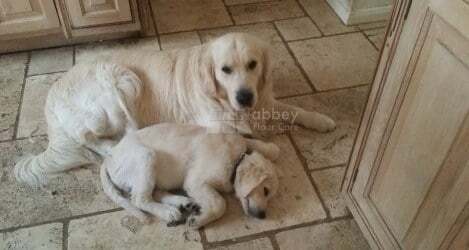 The home had two dogs, and the oils from the dogs made the soil very sticky and even more difficult to remove. Our client tried to keep the floor clean, but no matter how hard she tried, it would not stay clean. 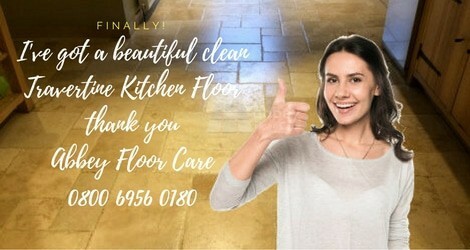 After searching online, she came across our site with plenty of before and after photos of our Travertine Cleaning work. We discussed the situation and agreed on a work schedule. We applied a heavy duty cleaner to the floor and left it for 20 minutes to start to break down the embedded greasy soil. Then we got to work with a rotary cleaner and our Travertine Cleaning compound. The cleaning compound is made up of microparticles that help remove stubborn ingrained soil from small scratches and the grout. Once we had finished scrubbing the floor, we removed the emulsified soil and oils with our pressurised rinse and capture equipment, leaving the tiles ready for sealing. We recommended sealing the floor with a low-sheen acrylic Tumbled Travertine surface sealer. An acrylic surface sealer protects the stone and makes the floor easier to clean. The sealer can also be topped-up when it shows signs of wear. Our client was absolutely delighted with the travertine cleaning work. We also gave the client maintenance instructions using microfiber cleaning mops and specialist cleaners. Correct cleaning will keep the floor clean and help maintain the finish for years to come.